LankaWeb – Beyond the Green Revolution; how humanity needs cutting-edge technology to save itself. Beyond the Green Revolution; how humanity needs cutting-edge technology to save itself. Some technicians dressed like surgeons in an operating theater are working in a vast tower sealed from the environment. It is full of hydroponic shelves, lights, pumps and small robots controlled by clusters of computers. This is ultra high-tech agriculture (UHTA). We are in a modern agro-factory tower that has replaced the farm with its soil, pests, pesticides, droughts and floods. Inspired by space agro-technology, it has no soil. It uses 95% LESS WATER than conventional high-intensity agriculture (HIA) popularized by the Green Revolution”. This is not science fiction (see figure). Such commercial UHT plants supply the markets since 2004 in New Jersy, USA. Similar agro-plants are being set up right inside city centers, within minutes to local markets, cutting transportation and warehousing. When low-intensity agriculture (LIA), e.g.,organic agriculture (OA) or traditional agriculture had reached the end of their tether, and when the world was at the brink of huge famines, HIA with its green revolution rescued the world. Now the green revolution itself is old technology, and a new UHT revolution is dawning, not only to feed the humans, but also to rescue the threat to the environment caused by the phenomenal human assault on the ecosystem. AVERTING THE HUMAN-MADE MASS EXTINCTION. In a previous article (Lankaweb: http://www.lankaweb.com/news/items/2019/02/19/how-a-menaced-humanity-facing-a-threatened-environment-turns-to-ludicrous-remedies/ or Island 19-02-2019) we examined how a menaced humanity facing a threatened environment foolishly turns to ludicrous remedies based on going back to an imagined glorious past of plenty” using traditional farming or organic agriculture. In reality, such technologies failed to feed the masses even in ancient times, when the populations were small. In Sri Lanka, even if all the tea, rubber and coconut lands could be converted to paddy fields, the Organic Agriculture harvests would still leave 75% of Sri Lankans starving. Populations in developing countries increased by a factor of five since WWII, vastly encroaching wilderness habitat and triggering a man-made mass extinction of species, further aggravated by agrochemical overuse. In this they merely joined the developed countries that pushed the industrial revolution using the wealth created by slavery that set up vast monoculture of crops that assaulted the ecosystem. In Sri Lanka, some 600K hectares are under tea cultivation, (http://www.statistics.gov.lk/agriculture/tea/all.pdf), about 600K under paddy,, and another 600K are used for rubber and coconut taken together. Forest cover had taken devastating hits with each giant irrigation and ‘colonization’ scheme starting from GalOya. The destruction of Sri Lankan wild elephants by their loss of habitat due to these ‘colonization schemes’ is merely the tip of the iceberg. Similarly, Europe is reeling from a rapid and disastrous loss of species, wild bees and other pollinating insects. This is mainly due to habitat loss and possibly to increased use of pesticides like neo-nicotinoids. Given the magnitude of the problem, it is imperative to reclaim the wilderness habitat for Nature. The HIA-green-revolution enabled us to use 1/5th the land and water for feeding compared to traditional agriculture (enabling us to feed fives times many mouths). The new UHTA is already capable of reducing the needed land extend to a mere 1/500 of HIA, and 1/2500 of organic agriculture. All the 600,000 hectare of paddy can be eventually reduced to 1200 hectares of grow towers. All the tea plantations can be eventually replaced by a few hundred grow towers clustered around an airport for direct export. All the tea land can be returned to jungle. Grow-towers are cut of from the environment and cause no negative effects. As the amounts of light, humidity and temperature inside the agro-towers are internally controlled, weather and seasons are irrelevant to its agriculture. Pests or weeds cannot enter the structure; so no pesticides are used. While conventional agriculture (CA) has an output of 5-10 times that of organic agriculture (OA), experimental UHT plants have achieved 400 times more output than CA and perhaps 2000-3000 times more harvest than OA for the same amount of water and land use. These bumper harvests ensure competitive prices. The products grown without soil are cleaner than from OA crops that bio-accumulate toxins usually present in most soils. Phenomics is the study of all observable characteristics of an organism. These characteristics (phenotypes) associated with a plant, such as the chemistry, color, genetic code, size, and so on. At AeroFarms Dr. April Caroll determines growth algorithms for plants growing under computer control. These farmers – the likes of Dr Caroll form a team of high-tech scientists drawn from artificial intelligence to molecular biology and plant physiology. While some 400 plant types have been successfully tested, one may ask, how can you grow fruits and plants which need pollination? While the green-revolution HIA used hybrid seeds, today we can redesign whole plants and insects. Captive bumble bees and other pollinator insects, genetically modified or not, may be used inside dedicated grow towers to pollinate tomatoes or blue berries. The possibilities are endless. 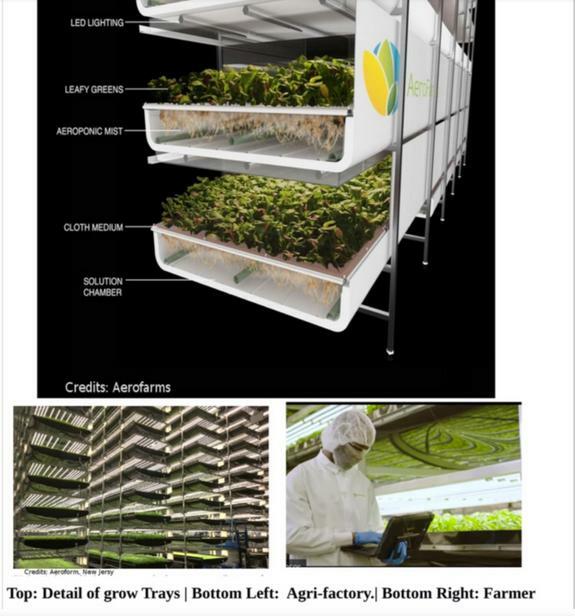 Nevertheless, many intermediate models that straddle the full indoor growth towers and the high-tech outdoor farms will be the norm for a decade. French vineyards are already experimenting with drone-controlled robotic farming. The robots are like little rovers designed for the exploration of Mars, equipped with sensors that test the soil nutrients, microorganisms etc. at each plant and spurt out the optimal amounts of moisture, salts, pesticides, or organic matter as needed. Such vineyards, controlled by artificial-intelligence algorithms based on phenomics use less than a hundredth of the agrochemicals usually employed. These outdoor farms need to get away from being single-crop monocultures. However, there are significant stumbling blocks to adopting UHTA. The public is frightened by technology. Modern Luddites have re-named the foods from biotechnology and genetic engineering to be Frankenfoods”. In India where the green-revolution took successful root, Vanadana Shiva and her likes have become street-heroes fighting” agrochemical multinationals and GM foods. They prevented the introduction of golden rice”, a rice that carries a Vitamin -A gene from carrots, thereby preventing blindness among millions who take simple rice diets. Golden rice was not made by multinationals, but by Indian scientists using minimal genetic manipulation. And yet false propaganda against it succeeded. A public that has been happily eating North American GM soya for decades banned GM golden rice! In Sri Lanka, France or California we have a glyphosate saga” illustrating how public fear translates into irrational actions against a very safe herbicide. It is probably the only substance whose safety has been checked continuously and rigorously for roughly a quarter century on nearly 90,000 members of farming communities (US govt. Health study, Andreotti et al., 2017). These farmers used glyphosate intensely, and without adverse health effects when compared to the general public. The public is completely lacking in a quantitative sense of the order of magnitude of hazards and healh risks. For instance, French consumers refuse to believe that the alcohol in wine is a WHO-classified class-I toxin. It is present at 10% level, but legislate against glyphosate present at 0.0000001% level! Glyhosate is only a class-II (PROBABLE) hazard similar to that of desinfectant soaps, while class-I toxins like alcohol are CERTAIN hazards.. However, when famine looms near, as it must when current agricultural technology gets over-whelmed, such public opposition will evaporate. Politicians will rally to it, and the new designer crops and UHTA will find its place just as the green-revolution-HIA was accepted by India against the opposition of many local lobbies. Another big hurdle that UHT agriculture will face is its energy needs. While increased-efficiency solar panels will help, the environmentally cleanest and cheapest source is from new nuclear plants. Conventional nuclear reactors cost $7 billion or more. But modern mini-reactors with little or no moving parts are much cheaper and meet high standards of safety (Science, vol. 363, issue 6429, p 806, 2019). Nuclear is already the largest source of zero-carbon energy in the Western world, and the second-largest source worldwide (after hydro-power). Developing nuclear power is essential to avert global warming and also to power new UHT agricultural systems. Besides the existing 450 reactors, some 70 new nuclear plants are under construction, mostly in China. The public fears nuclear energy, but a comparison of the death-print” from different energy sources shows it to be the safest although a high hazard. The death-print” is the number of people killed per unit of energy (say, per trillion kWH). Coal is the worst, and nuclear is the best even after including the death toll from uranium mining and all accidents and not just the spectacular ones like Fukushima. Using WHO and other data, the death-print figures are: coal (170,000), oil (36,000), Biomass (24,000), Natural gas (4,000), hydro (1,400), solar (440), and nuclear (90). A major problem for the nuclear industry is its hazardous radio-active waste products. These contribute to the proliferation of nuclear weapons. The lasting solution to this is the BREEDER reactor. These burn nuclear waste to produce a final non-radioactive product like lead. France was the initial leader, but its socialist government shut the research decades ago, under pressure from the anti-nuclear Green lobby. Today, only five or six are operating: three in Russia, one each in China, India and USA. These 4th generation nuclear reactor are economical, safe, produces negligible waste matter, terrorist proof and avoid nuclear proliferation. The present author favours the duel-fluid reactor (DFR) designs (see Figure) where the nuclear fuel is input as a molten salt, while the coolant is a liquid metal (e.g., lead). Such reactors using thorium is an attractive possibility for Sri Lanka that has thorium-rich monozite sands. After the initial start up, depending on neutron economy and fuel mixture, DFR will produce its own fissile fuel! The needed technology can be transferred to Sri Lanka via a partner nation. In comparison, oil exploration in the Palk Straits is very disadvantageous to a small country not only because of irreparable oil-spill accidents, but also because oil is a magnet for powerful countries that subjugate small countries for their oil. We see this in the Middle East, Nigeria and Latin America. Fear of loss of employment. Each wave of technology, especially in labour intensive sectors like agriculture poses the specter of unemployment. But as jobs disappear, many new jobs are created, although at a higher technical level. Productive societies can afford to pay a universal basic salary to everyone irrespective of employment, as envisaged in some rich Nordic countries. IMMEDIATE STEPS TO AVERT ECOLOGICAL DISASTER. While cutting-edge energy and agricultural solutions are being implemented, immediate steps to avert tragedy are also needed. We cannot go back to traditional farming, or to cherished Gama-Weva-Pansala” (Village-Reservoir-Temple ) aka Panchayat” models because such models imply massive habitat encroachment and low prosperity. Reduction of habitat loss and diversification of monocultures. Protecting biodiversity requires preventing habitat loss and giving land back to nature. All homesteads, farmers and plantations should convert 10-15% of their land to manged wilderness. Wilderness belts should be linked to larger conservation areas. Highways need underpasses for animal crossings, linking ecological areas. Low-intensity farmland should be returned to jungle. Urban sprawl should be shrunk into dense high-rise living. If governments execute the minimum proposals of climate summits, there is indeed a chance to avert famines, inundations by the sea, irreversible damage to the ice caps, Himalayas and environmental hot spots. Moving away from meat, diary, and organic foods is essential for the reduction of green house gases. The production of meat or milk needs much pasture lands, water, and release greenhouse gases (GG). Organic farming increases GG and causes soil erosion. Air travel produces a lot of garbage, unrecyclable plastic and GG. Air transport should be replaced by ultra-fast electric trains moving close to supersonic speeds. Recycling to reduce environmental impact, & educating the public. Burning of plastics and toxic garbage etc have to be controlled, and proper waste management and clean air and water management should be a top priority. Education about ecosystems should begin in schools itself, but it run the risk of hijacking by lobby groups (like Organic food vendors), NGOs pushing some agenda, and even politically powerful Psychics peddling, say, God Natha. Hence curricula needs tight control by academic and professional bodies. The shift away from fossil fuels to alternatives, boosting nuclear energy are a must. Irrigation projects with no concern for the total ecology should be stopped. Solar panels and wind turbines should not compete with the habitat for flora and fauna. Maximum use of modern agriculture and biotechnology. Scientific agriculture drawing from the very frontier of knowledge, and not going back to the past is essential to minimize the use of land and water. Unwanted entry of agrochemicals into the eco-sphere should be controlled using WHO guidelines. Where there is doubt about safety, the precautionary principle of constraint and control” rather than the method of ban and banish”, should be used. In Sri Lanka there are strict environmental laws. Unfortunately, they seem to be quite irrelevant to all sorts of favoured companies or individuals backed by politicians. So the rule of law must be enforced.